Lots more events in the works! Please check back if you'd like to see an updated calendar. April 28 Sunday, 1:15 pm. The grange (Alexander Hamilton’s house). Presented as part of “Hamilton’s Eden”: A volunteer cleanup, gardening, and botany celebration, 11 am-3 pm. 414 West 141st Street/Saint nicholas Park. New York, NY. Details here. May 3 Friday. Missouri Botanical Garden. St. Louis, MO. open to the public. May 14 Wednesday. Stanford University’s Center on PHilanthropy and Civil Society. Co-Sponsored by Filoli. Palo Alto, CA. Open to the Public. may 15 Wednesday 10 am-12 pm. uC Botanical Garden at berkeley. Berkeley, Ca. open to the public. Details here. may 21 ColumbiA Alumni Association of Southern California. Details to Come. may 22 Redlands Forum, ESRI. Redlands, CA. Details to Come. may 23 Thursday, 2:30 pm. HuntingTon library. Pasadena, Ca. open to the public. may 30 Thursday. American Philosophical Society. Philadelphia, PA. open to the public. Details Here. june 6 Thursday. Gilder Lehrman institute history scholars program. private event. June 18 Tuesday. ROyal Botanic Garden Edinburgh. Edinburgh, Scotland. June 20 Thursday. Linnean Society. London, England. Details Here. June 29 SATURDAY, 1-2 pm. American museum & gardens. bath, England. Register here. July 2 Tuesday, 6:30 PM. Worshipful society of apothecaries. London, England. open to the public. July 4 Thursday, 7:30 PM. Curtis Museum. Allen Gallery, Church Street, Alton, England. open to the public. july 9 tuesday. mclean & eakin bookstore. petoskey, MI. Details here. july 11 THursday. 7:30 pm. Keynote speech, Annual Commemoration of the Hamilton-Burr duel, Weehawken, NJ. Presented by the alexander hamilton awareness society, the town of Weehawken, and the Weehawken historical commission as part of the AHA Society’s “CelebrateHamilton” Program. Elks lodge, 2 50th St, Weehawken, NJ. July 22 Monday, 4 pm. The Mount, Edith Wharton’s home. Lenox, MA. July 23 Tuesday, 11 am. The Mount, Edith Wharton’s home. Lenox, MA. July 25 Edgartown Yacht Club. Edgartown, MA. private event. Aug 5 Monday. Boothbay Harbor Yacht Club. Boothbay, ME. Aug 6 Tuesday. Book-signing, Coastal Maine Botanical Gardens. 132 Botanical Gardens Drive, Boothbay, ME. Sept 1 Sunday. mountain top arboretum. Tannersville, Ny. open to the public. Sept 12 Thursday, 6:30 pm. Fraunces Tavern Museum. 54 Pearl Street, New York, NY. open to the public. Sept 20 Friday. 10 am-1 pm. The New York Botanical Garden. keynote address, Second annual ecoflora conference: The Historical Flora of New York CIty. New York, NY. Details here. Jan 6 Monday. garden club of new haven. new haven, ct.
Feb 4 Tuesday. GarDen Club of Hartford. Hartford, CT.
Feb 19 Wednesday. GarDen Club of houston. Houston, tx. May 29-31 george washington’s mount Vernon. Mount Vernon, VA.
June 6 THE New York Public Library. New York, NY, Cullman Center for Scholars & Writers. Interview by MAYA JASANOFF, Author of Liberty's Exiles and the Dawn Watch. June 22 The New York Botanical Garden. New York, NY. Talk co-presented with The New York Academy of Medicine. June 30 Politics and Prose Bookstore. Washington, D.C.
JULY 9 MOUNTAIN GARDEN CLUB. HIGHLANDS, NC. JULY 12 Kansas City Public library. kansas City, MO. July 19 Piedmont Physic Garden. union, Sc. July 24 north Carolina Arboretum. asheville, nc. Sept 13 Westport Library & Westport Garden Club. Westport, CT.
Sept 15 united States Botanic Garden. Washington, DC. oct 5 John Carter Brown library. brown university, providence, ri. oct 9 The Heberden Society, Weill Cornell Medicine. New York Academy of Medicine. New York, NY. Oct 16 Lehman Center for American history, Columbia University. New York, NY. Oct 18 andrew Carnegie Distinguished Lecture FOR The new York botanical Garden. SPECIAL LOCATION: CHristie's, 20 Rockefeller plaza. New York, NY. Oct 21 frelinghuysen Arboretum. Morris Township, nj. Oct 27 Connecticut Botanical Society. Rockfall, CT.
Nov 1 University of Delaware Botanic Gardens. Newark, De. Nov 2 Botanic Garden of smith College. northampton, ma. Nov 10 Portland Art Museum. Pop-up event for the portland book festival. Portland, OR. Nov 10 An evening with the national Book awards. PoRTLAND BOOK FESTIVAL. Portland, OR. Nov 13 National Book Awards Reading. The New School. New York, NY. Nov 16 An Evening with the National Book Awards winners and Finalists. Miami Book Fair. Miami, Fl. Dec 3 Columbia University irving Medical Center. Augustus C. Long Health Sciences Library. New York, ny. Dec 5 Garden Club of America. New York, NY. Dec 10 Boston Junior League Garden Club. Boston, MA. Dec 11 New England Historic Genealogical Society. Boston, MA. Jan 9 Massachusetts Historical Society. Boston, MA. Jan 15 Charleston Library Society. Charleston, SC. Jan 17 Miami Beach Botanical Garden. Miami, FL. Jan 18 Books & Books. COral Gables, Fl. Jan 24 Lenoir-Rhyne University. Asheville, NC. joint event with #1 New York Times Bestselling novelist (& my sister!) Elizabeth kostova. Jan 30 Pennsylvania Horticultural Society. Ambler, PA.
Feb 7 HUDSON LIBRARY and Historical Society. Hudson, Oh. 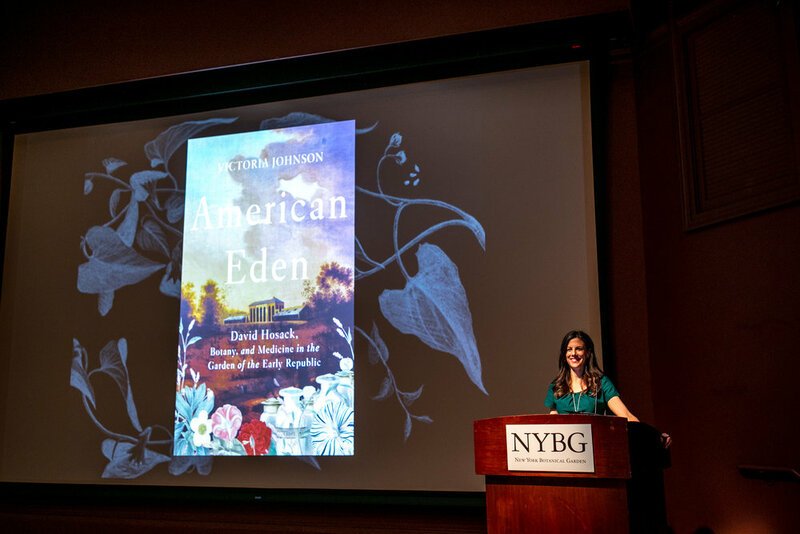 Feb 12 Linnaean Society of New York. New York, NY. Feb 15 Amherst College. Amherst, MA. Feb 17 Tower Hill Botanic Garden. Boylston, MA. Feb 25 PEN AMERICA WINTER 2019 AUTHORS’ EVENING WITH VICTORIA JOHNSON. New York, NY. Feb 27 Joint event with Elizabeth barlow Rogers, author of Saving Central Park (Knopf 2018). SHakespeare & co. Bookstore, New York, NY. Feb 28 Bartlett Arboretum & Gardens. Stamford, CT.
Mar 1 cosmos club. washington, dc. Mar 7 Elizabeth park Conservancy. west hartford, ct.
Mar 16 Hardy Plant Society, Mid-Atlantic Group. Media, PA.
April 6 Queens Botanical Garden. New York, NY. April 9 The Garden Club of Philadelphia. Philadelphia, Pa.
April 10 The Atlanta history center. Atlanta, GA.
April 13 New-York Historical Society. New York, NY. April 18 jay heritage Center. Rye, NY.